Vermont’s mayors are getting serious about rail and it’s easy to see why. 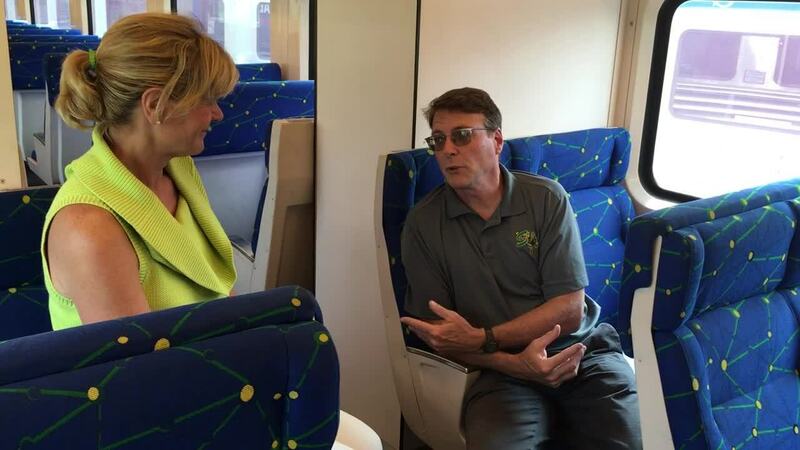 Dave Allaire, mayor of Rutland, and Tim Smith, mayor of St. Albans, took a short ride on the newly refurbished Budd RDC cars on August 27, in Barre. They experienced the sights and smells of the Budd cars before they begin their new life transporting Vermonters and visitors. Allaire and Smith are both enthusiastic about improving passenger rail services that run through Rutland and St. Albans – a service All Earth Rail envisions implementing with the very Budd cars the mayors visited. Just imagine the possibilities: ride the rails to get to work, go to cultural events & visit with family & friends. Like the mayor of Rutland, Smith endorsed AllEarth Rail’s plans, understanding the importance of rail. Smith sees rail as an opportunity to bolster the corridor between Franklin and Chittenden counties. Smith explained that 10,000 residents of Franklin county travel south on the interstate every day for work, while 4,500 people also come into the county from elsewhere for employment. Dave Allaire summed things up aptly, when he said, “I think passenger rail is about to have a renaissance.” With the development of urban areas and economic centers, young people want to live near places where the activities and services are located. Commuter rail can provide efficient, affordable and convenient transportation. As we know, trains are more environmentally friendly than cars. With 42 percent of Vermont’s greenhouse gasses produced by transportation, reducing car traffic and increasing public transportation usage is critical to reducing our carbon footprint. Trains are also economically advantageous to businesses, commuters, and property owners. In fact, it’s a crucial and largely untapped economic development opportunity. Trains have been shown to bring in $7 of private investment for every $1 of public investment, according to a Dallas Area Rapid Transit (DART) study. Moreover, the U.S. Department of Commerce reports that every $1 invested in rail attracts $10 in local economic activity. DART’s research between 1999 and 2015 showed a very positive economic impact. Residential and commercial properties within ¼ mile from a station rose in value more than comparable property farther away from transit. The Budd cars that will be serving our communities were purchased from DART, so you could say these trains already have a proven track record in building sustainable economic development. Eighty percent of Vermonters live within one mile of a rail station, so using existing rail can both transport the population and improve property values of those who live near them. It helps create vibrant and self-sustaining communities with flourishing business. Why not rail? Why not here? Stay tuned for more updates on the promise of regional rail in Vermont, and what you can do. Stay tuned for more updates! Sign up for VRAN Rail Futures updates using the form to your right.